The compiler has been given an ASTNode representing the element called “statement_block” in the above grammar. It contains zero or more children of the type “statement”, each of those contain either an “exp_assignment” or an “exp_local_declaration” as their child node, etc. Now, Hime is essentially a black box. It’s licensed under the LGPL – so we won’t be messing with their expression tree. I also am not using callbacks to respond to the parse tree as it’s generated (much like you might do when parsing a data file like JSON or the comedy YAML option), so we’re looking at a complete AST. 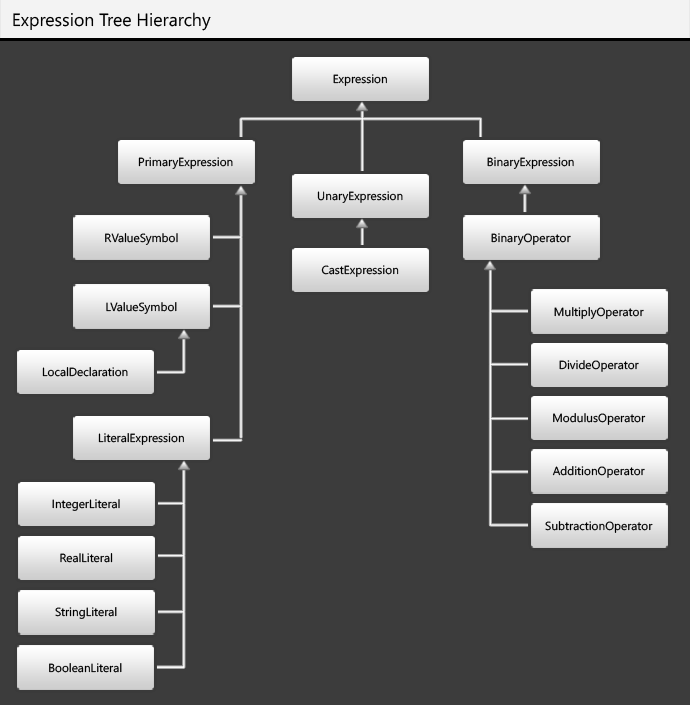 My plan is to convert the Hime tree into my own expression class type. This class will provide some basic interfaces such as the computed type of the expression (like an int or a float). Expression classes will be extended for each language feature, and these classes are responsible for doing the code validation as well as generating the opcodes. And so on for each operator. In the example with the AdditionOperator, because it is a binary operator with two children, two additional expressions are needed as arguments in the constructor – these come from further invocations of the AST->expression function (“ConstructExpression”). Once we have our own expression classes generated, we can begin to do some actual semantic analysis. I have done this by giving each expression a virtual method (“Fold”, because of constant-expression folding, although it’s probably misnamed), where the expression is allowed to perform checks, and possibly even return an entirely different expression back – so, for example an AdditionOperator may see that both its left and right children are IntegerLiterals. During the Fold() process, it should return a new IntegerLiteral with the sum of the two child nodes. This folding operation is done depth first. An example for the Fold() operation for a binary operator is this – SimplifyLiteral is virtual and dealt with via the inherited classes. Ideally, once the Fold() operation is completed, the statement should be valid (any errors should be generated earlier, as that is where you have the best chance at introspection), and ready for code generation. Amazingly, we’re back on a familiar topic, types and conversions. You see, the simple operators that we’re dealing with could actually be reasonably complex in their type behaviour – and we need explicit rules, or – as I have mentioned before – we will fall into the pit of PHP, and madness that way lies. So – we need to come up with some sensible rules. Remember, we’re not specifying the result type, per se – we are specifying the type that the calculation is performed with. As such, we need to select a format which is most able to represent the gamut of results. For narrow integer types, this is pretty straightforward – these are already represented as 32-bit signed integer types on the stack. For floats and doubles, they will always be more representative than integers (although potentially less accurate), making them the intermediate (and result) type for any operations. The problems arise when we look at the 32- and 64-bit integer types. Words is not a language which checks for (or is concerned with) overflow in results – that said, we will duplicate a few rules established by C#. When operating on a mixture of signed and unsigned values, the integer type is promoted to a wider, signed format. This means that a mixture of a uint and any signed type will result in a long. Where no promotion is available (e.g., ulong and long), the operation produces a compile time error. These rules can, depending on your perspective, be reasonably sane or quite arbitrary. The main justification – “What Would C# Do?” – is ultimately just another arbitrary source. However, the promotion rules mean that when you’re dealing with mixed types, it should just work*There are always corner cases, but we live for the now, so stuff them!. The assumption is that if you’re not mixing your types, you know what you’re doing. Since all the calculations on narrow integer types are done in 32-bits, you will have to explicitly cast the result back down to a narrow format. Similarly, we must be careful when upcasting from integer types to floating-point formats. Interestingly, I don’t believe downcasting is an issue – truncation is always going to produce some fun results, but I’m pretty sure you can go from larger formats to narrower formats by simply masking off the bits you want. Downcasting from float formats to integer formats involves going to the appropriately sized signed format and then reinterpreting the result as unsigned. 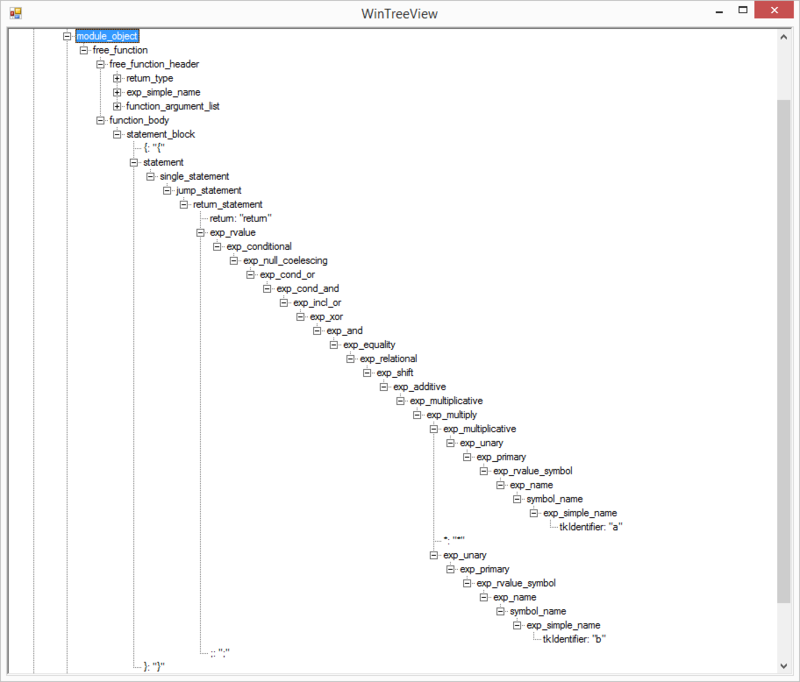 Since I have already decided that the Words VM will be a stack machine, it has to deal with heterogeneous types too. It therefore isn’t sensible to have a single opcode, such as Add for performing addition – while inputs are going to be converted, the VM shouldn’t be required to introspect the stack elements to decide whether to perform (e.g.) an addition 32-bit or 64-bit integers; especially given that this information is available to the compiler. Given the five operators, * / % + and -, three of them are “sign-agnostic”. Because of how results are truncated in CPUs, we can perform multiplication, addition and subtraction without caring if the inputs are signed or unsigned. // Note that the lower 32 bits are identical! As a final addition (get it!) we add a special variant of “Add” for strings – because strings are, after all, a core language type. To be honest, this is a pattern I’ve used many times before, and thankfully Visual Studio emits a warning if you do that*Essentially gently telling you that you almost certainly did that wrong, which as far as I’m concerned is an admission of guilt that the parsing is probably a bit non-intuitive. Next time, we’ll finally get onto the IL generation, as well as how locals work! I still stand by my two prior assertions: this will undoubtedly haunt me from now on, and that people ~generally~ want &&, not &.